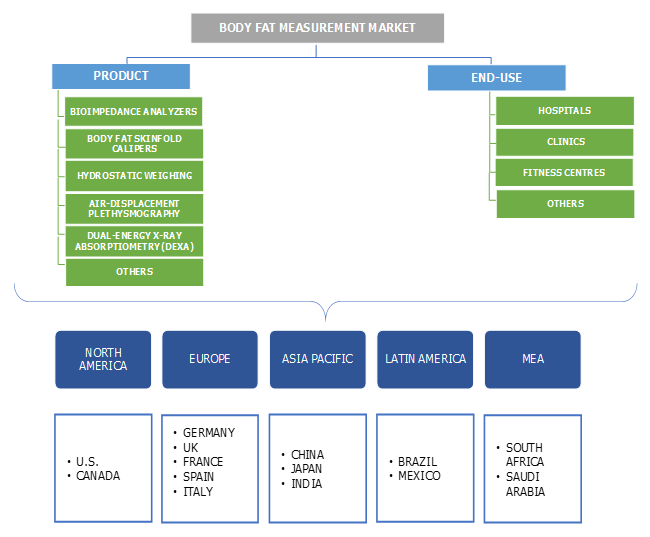 Body Fat Measurement Market size was valued at over USD 460 million in 2017 and is expected to witness growth of over 8.2% CAGR from 2018 to 2024. Expanding number of obese people across the world will stimulate the market growth in the forthcoming years. As per World Health Organization Global Health Observatory (GHO), about 12.8% of global adults were obese in 2014, with 27.7% of obese population in North America and Europe. Obesity is one of the major impacting factors of metabolic disorders such as type 2 diabetes mellitus. This requires proper assessment of body fat composition for determining association of the body fat with the disorder. Thus, accelerating pervasiveness of obesity will impel demand for body fat measurement devices in the coming years. Growing awareness and implementation of body weight management measures will positively impact body fat measurement business growth in the upcoming period. Several countries are undertaking programs and initiatives to raise awareness and promote healthy weight management program. For instance, many organizations are commissioned for providing weight management services in UK. Such initiatives will accelerate the demand for body fat measurement devices across developed and developing countries. However, high cost of body fat measurement devices is estimated to be a negatively impacting factor for body fat measurement industry growth. Bioimpedance analyzers (BIA) product segment held over 35% market share in 2017 and is forecasted to witness lucrative growth over the upcoming period. Affordable cost range of the product will be a major driving factor for segmental growth. Bioimpedance analyzers being portable and handy will drive the customer preference for the product. In addition, advancements in BIA device such as BIA by InBody, overcoming former limitations and offering greater accuracy will escalate the demand for the product in the forthcoming years. Dual-Energy X-Ray Absorptiometry (DEXA) is forecasted to progress at 8.6% CAGR during the projection timeframe. High accuracy and convenience of use will be the high impacting factors for segmental growth. DEXA provides detailed assessment of body components at three-degree level including bone, lean mass and fat. Moreover, no invasion, quick diagnosis and outcomes will expand product adoption in the coming years. Hospitals end-use segment accounted for the largest revenue share of over 35% in 2017 and will grow at fast pace in coming years. Hospitals prefer utilization of high-end technology for enhanced detection of disorders and causative factors. Advanced body fat measurement devices such as DEXA and ADP offer quick and precise estimation of total body fat. With rising number of metabolic disorders, obesity and other obesity-associated disorders, hospitals segment will witness robust growth in the foreseeable future. Fitness centres end-use segment is forecasted to progress at 9.8% CAGR during the projection timeframe. 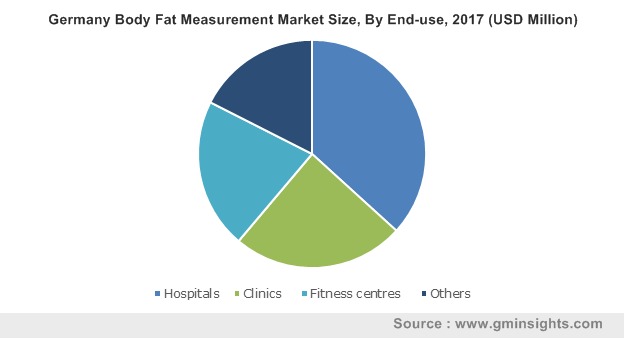 Affordability and mobility will be the primary factors for high adoption of body fat measurement devices at fitness centres. Fitness centres are rapidly growing owing to rising preference for fitness and weight management. Hence, rising prevalence of obesity, will offer attractive fitness centres segmental growth opportunity in upcoming years. 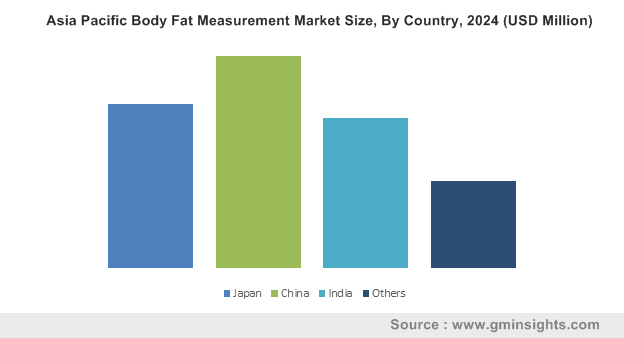 U.S. market accounted for more than 85% market share of North America body fat measurement market in 2017. High number of obese and overweight Americans will impel U.S. body fat measurement industry growth in future. As per Robert Wood Johnson Foundation, 18.5% children were found to be obese during 2015-16. Additionally, high awareness and national obesity initiatives will augment U.S. body fat measurement industry growth. Germany market will witness 7.5% CAGR over the forecast timeframe. High growth can be attributed to high obesity prevalence in the country. According to WHO, obesity is among top ranked problems in the nation, especially among children. In addition, adoption of technologically advanced products in the nation will positively impact German market growth in the forthcoming years. Some of the major players operating in global body fat measurement industry include Hologic, GE Healthcare, Omron, InBody and Cosmed. Companies are adopting inorganic strategic measures and novel product introduction through technological advancements to expand company’s market presence. For instance, in March 2013, DMS unveiled 3D-DXA at the ECR 2013. The technological advancement was aimed at enhancing customer base and fortifying company’s product line. The history of bioelectrical impedance analysers can be traced back to 1962, when a French physicist developed the first BIA device to measure biological tissues. Later, in 1786, an Italian physicist tested the influence off electric current on the tissues of frog. Following studies and research, led to the enhancement of BIA device. However, it possessed serious flaws and inaccuracy. In late 1900s, the company launched advanced BIA device leading to rapid adoption of the product. In addition, consecutive advancements of the products, offering high precision and outcomes such as air displacement plethysmography and DEXA led to development of body fat measurement industry growth. 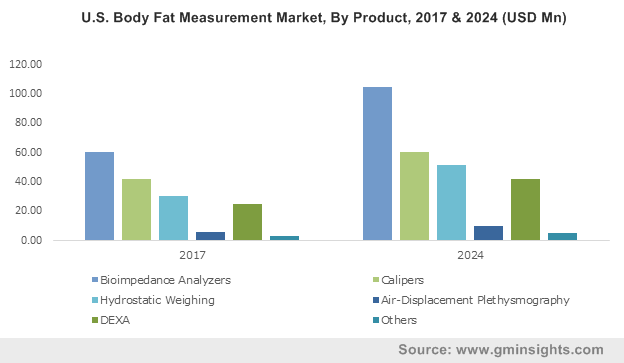 Aforementioned advancements coupled with rising obese population and implementation of weight management measures will augment body fat measurement industry growth in the foreseeable future.